Kathak, the classical dance of North India, combines virtuosic footwork and dazzling spins with subtle pantomime and soft gestures. As a global practice and one of India's cultural markers, kathak dance is often presented as heir to an ancient Hindu devotional tradition in which men called Kathakas danced and told stories in temples. The dance's repertoire and movement vocabulary, however, tell a different story of syncretic origins and hybrid history - it is a dance that is both Muslim and Hindu, both devotional and entertaining, and both male and female. Kathak's multiple roots can be found in rural theatre, embodied rhythmic repertoire, and courtesan performance practice, and its history is inextricable from the history of empire, colonialism, and independence in India. 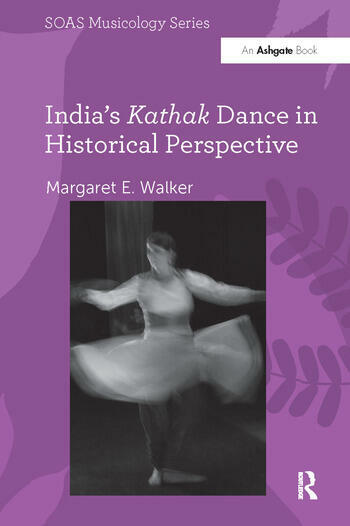 Through an analysis both broad and deep of primary and secondary sources, ethnography, iconography and current performance practice, Margaret Walker undertakes a critical approach to the history of kathak dance and presents new data about hereditary performing artists, gendered contexts and practices, and postcolonial cultural reclamation. The account that emerges places kathak and the Kathaks firmly into the living context of North Indian performing arts. Contents: Preface; Kathak dance today; Colonialism and nationalism; The Kathaks; In search of an ancient Kathak; Voices from the18th and 19th centuries; Hereditary performing communities in North India; More hereditary performers: the women; Nationalism and revival: the dance of the Kathaks; Classicization and curriculum: Kathak dance; Conclusion: a history of Kathak; Bibliography; Index. Margaret E. Walker is Associate Professor of Ethnomusicology and Musicology at Queen's University, Kingston, where she is currently serving as Director of the School of Music. Her research focuses primarily on kathak dance and its historiography, but also includes work on gender, class, diaspora, and colonialism.